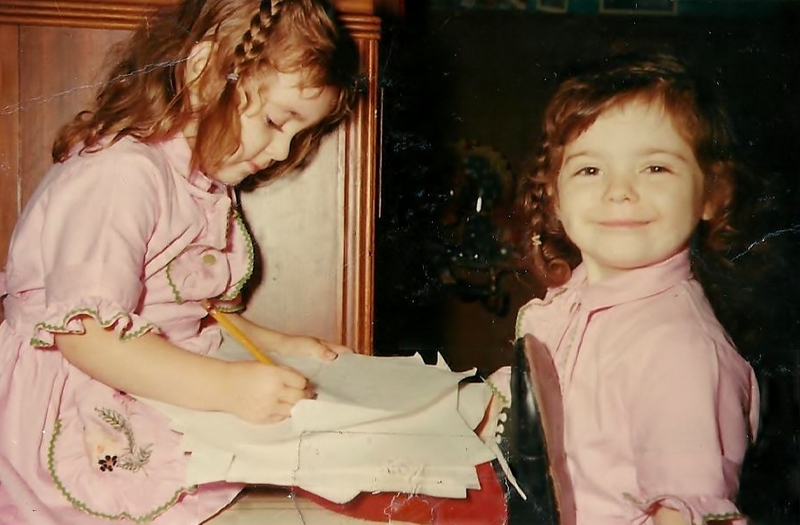 I’m either three or four here (my sister Kathy, a year older). Drawing up a storm from the amount of paper in my lap. I’m not sure if you choose to be an artist. Maybe you just are. Maybe we all are, but only some of us are lucky enough to embrace it. Maybe your life on Earth is supposed to be filled with love for everything, and that includes depicting that emotion in art. 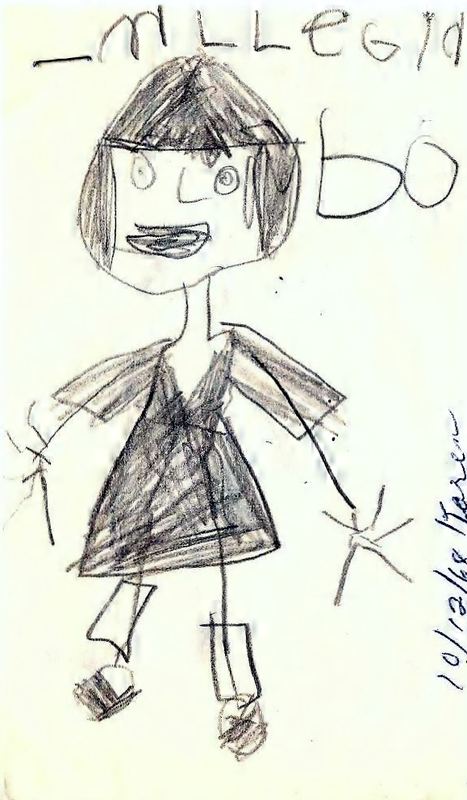 I’ve been drawing for as long as I can remember. 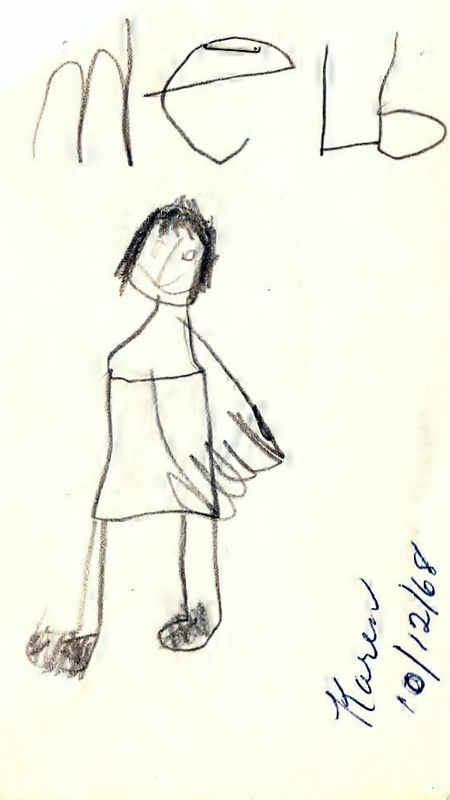 I found these images in my baby book, done when I was five. I’m pretty proud of the fact that I could draw girls with necks – wow. It looks like I’ve named them too. I imagine they are probably people from TV. 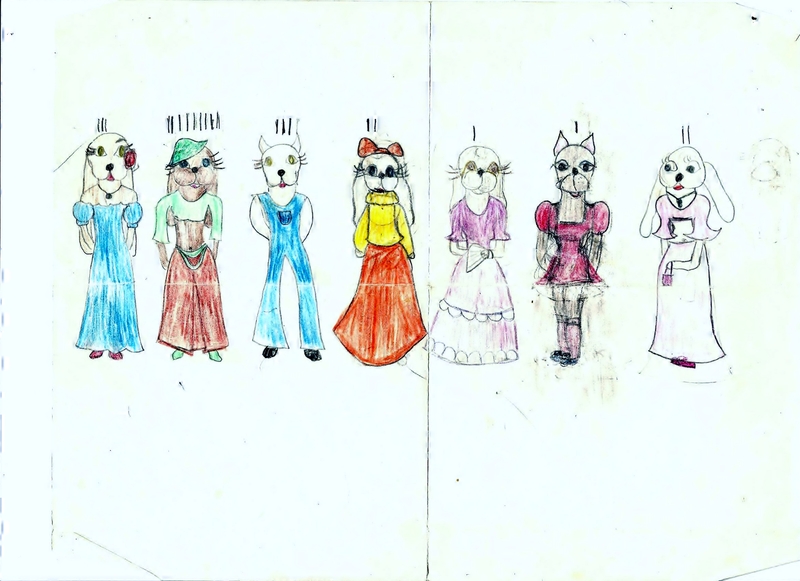 When I was in 4th or 5th grade, my friends and I would draw these silly fashion beauty contests with puppy-faced models then ask people to vote on their favorite one. My friend Janet’s mother was an art teacher and I’ve since told them how much knowing them both contributed to my trajectory as an artist and ultimately my career – Janet at our 20th reunion and Carolyn Coit when I worked with her during my student teaching experience at Fayetteville-Manlius High School (and also her last year teaching before retiring). 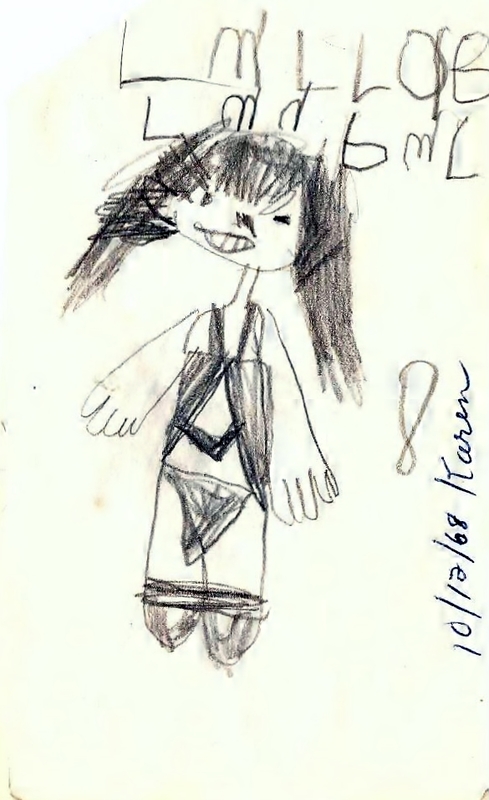 I’d wanted to be as good an artist as I thought Janet was, and so, I spent many evenings and weekends in my room doodling away at my “craft”. My grandparents (my mother’s parents) lived with us until they passed away. In the 1970s, my grandmother had a group of lady friends with whom she played penny Bingo every other Saturday. They traveled from house to house, and one Saturday, when it was our turn to host, Auntie Blaga came to pick up her mother. Mom told me to go and get my drawings to show her, as she had been an art teacher. I think she’d already retired by then. She was actually only a few years younger than Gramma, which was weird because she had the kind of effervescence and exuberance that was almost iconic. I can’t explain that certain something but that positive energy probably contributed to her ninety-nine year long life. I went to calling hours last Thursday and it was there I found out Auntie Blaga had taught art for forty-five years in the Syracuse City School district. She’d changed her name to Evangeline Peters because she thought her real last name would be too difficult for kids to learn to pronounce. The real world knew her as Eve. She was so nice, so complimentary and, although it wasn’t at that moment I thought I would grow up to follow in her footsteps and become an art teacher, that day in around 1974 was a significant moment in my life. The way she spoke to me, like I was an equal and not just a nine-year-old, you know? I remember that conversation as if it were yesterday. Fast forward to fifteen years ago. I had an art exhibition at the May Memorial Unitarian Church in Dewitt, NY. Auntie Blaga showed up. She was still driving then. She didn’t look a day older twenty-something years later but was most definitely a lot tinier than I remembered her. I’d expected a bigger turn out but only about twenty people showed up. I spent a lot of time writing press releases and was lucky enough to have the opening advertised in the newspaper. The reception was even covered on the channel 5 news so that was pretty cool. 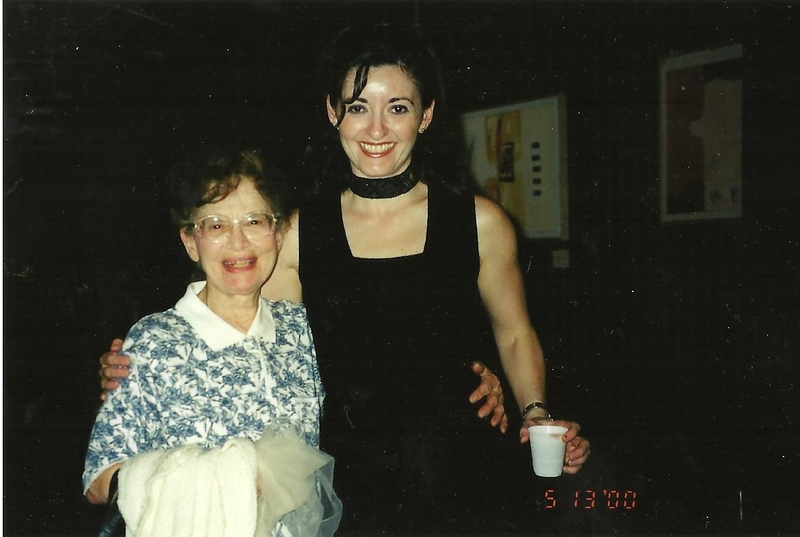 But the very best part of it was when Auntie Blaga said she’d seen my name in the arts section of the newspaper many times – she’d been following my career. When something like that happens, it almost doesn’t even matter if you ever attain the kind of success you imagine for yourself. Auntie Blaga was here now, almost like a little fairy Godmother who really, really cared. I mean, she must have been eighty-five then. About six years later, she came to the reception I had at the Westcott Community Center. It is an art venue in an old fire station on the corner of Westcott and Euclid, near Syracuse University. She wasn’t driving anymore. Her grand nephew, Craig, became her caretaker and he brought her up in the elevator and into the small space where my Mom had set up the food spread of cupcakes and way too many treats, as per usual. Auntie Blaga had injured her back, I think, and was using a walker, but her spirit was that same unique blend of happiness and sparkle. I couldn’t believe she came. And the funny thing, like the way it is with old friends – we just picked up where we’d left off. Later we spoke on the phone a few times and talked about visiting each other but I lived in a second floor walk-up flat and she said sometimes she couldn’t hear the door when someone knocked at her house. We continued to correspond. She’d write me letters at Christmas and tell me how proud she was of me. I didn’t make the effort to visit her. I should have and it makes me feel really bad. Like I’m a horrible person for not being there for her. When I think about it now and think about the stuff I was going through at the time – I cannot justify why I wasn’t a better friend. She never married nor had any children, see, and so she was kind of like me in the future. I should have made the effort. Auntie Blaga wasn’t related to me despite the moniker. She had a real family of grand nieces and nephews. I think her brother had seven children who had children. She was well loved. They didn’t know me. But I do want them to know that she meant the world to me. 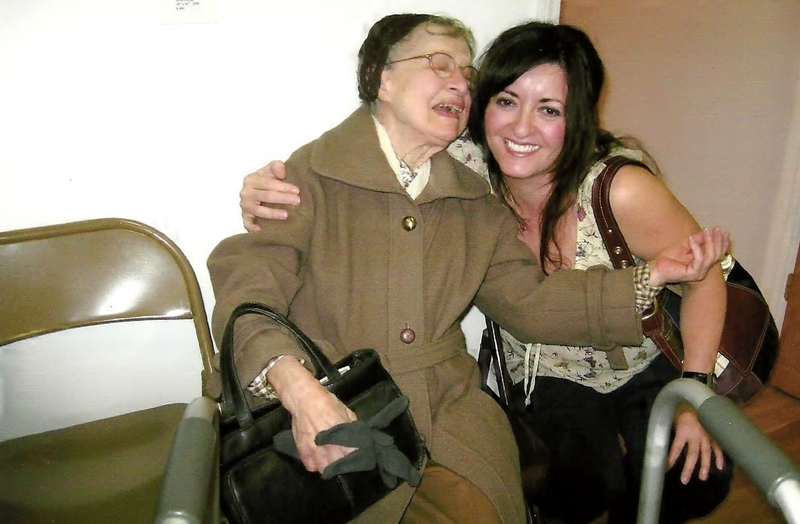 Auntie Blaga – knowing you contributed more than just a trajectory of career choice. You believed in me before anyone else did. You saw something in me that I didn’t see in myself then, something I want to believe is there now. Good-bye for now, my friend. I will cherish your memory in my heart. Always.